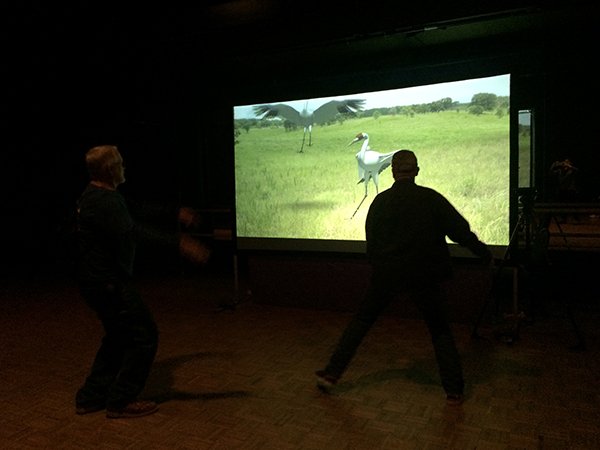 Mimicking Whooper uses state of the art gaming software to provide an opportunity to virtually interact with Whooping Cranes – to figuratively dance their dance. Direct interaction with Cranes is a rare experience reserved for those in wildlife management and Crane conservation programs. However – when observing them in person I have a strong desire to mimick their movements and communicate with them. That desire inspired me to create Mimicking Whooper. 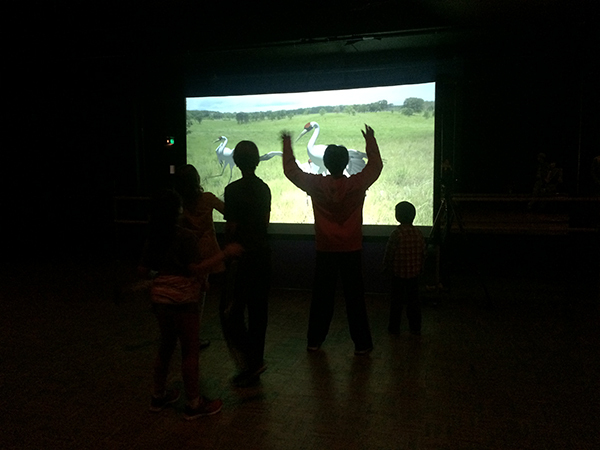 Virtual interaction provides an engaging, fun and personalized glimpse into the magnificent world of Crane behavior. The Crane has approximately 30 communicative gestures and many distinct vocal forms of communication. This participatory piece is a reminder that people and Cranes are not as different as we might seem. The Whooping Crane has been on the endangered species list since 1967, and is the subject of a population recovery program that includes migration training. The Sandhill Crane has been the subject of the most successful recovery program to date, bringing the species’ numbers back from the brink of extinction. 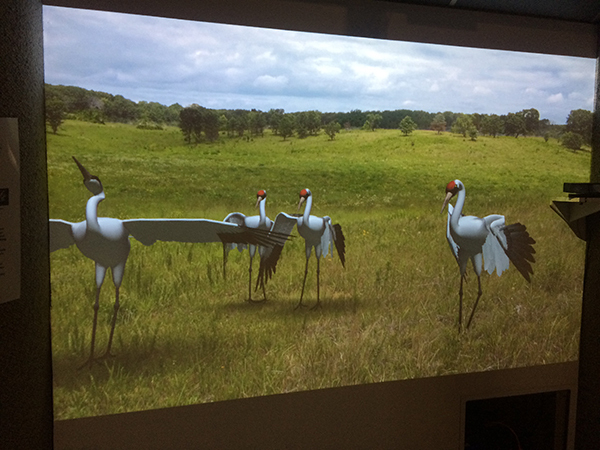 In collaboration with the IRC (Imaging Research Center) at UMBC, this a 3-D, life-size, fully feathered Whooping Crane projection is configured by using Kinect software and Unity to mimick typical Crane behavior. 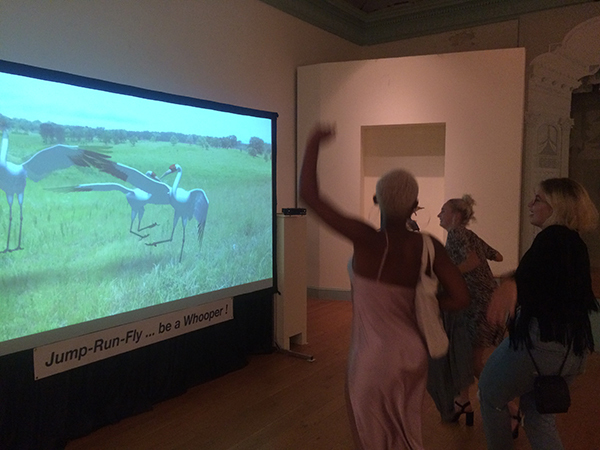 In this “dance” it is my hope that besides being fun – empathy, understanding and the foundations of environmental stewardship will take flight. Note: Do not attempt this with live cranes! 2018- Manawa Community Art Tour, Manawa, WI. 2017- “Birdland and the Anthropocene”, group show, Peale Museum, Baltimore MD. 2017- “SPARK,” A Light City Satellite Art Space – UMBC, Baltimore, MD. 2016- Mitchell Street District, outdoor exhibition “Temporary Resurfacing 2016”, group show, Milwaukee, WI. 2016- UMBC, “50th Anniversary Celebration”, Baltimore, MD. 2016- University of MD – College Park, MD. 2016- VisArts, Premiere of Cranes in Motion, Rockville, MD.